Lois Lerner impliedly waived her Fifth Amendment right against self-incrimination, according to a party-line vote in the House Government Oversight Committee today. Lerner entered a brief statement declaring her innocence before invoking the Fifth Amendment during a May 14 appearance before the committee to discuss her role in the IRS scandal targeting conservative groups for extra scrutiny. Soon after, Lerner was placed on administrative leave from the IRS. The resolution is the first step in a process that could result in a Contempt of Congress citation against Lerner. If so, she would be the second Obama administration political appointee to receive the highest form of censure by a congressional chamber. The other person: Attorney General Eric Holder. 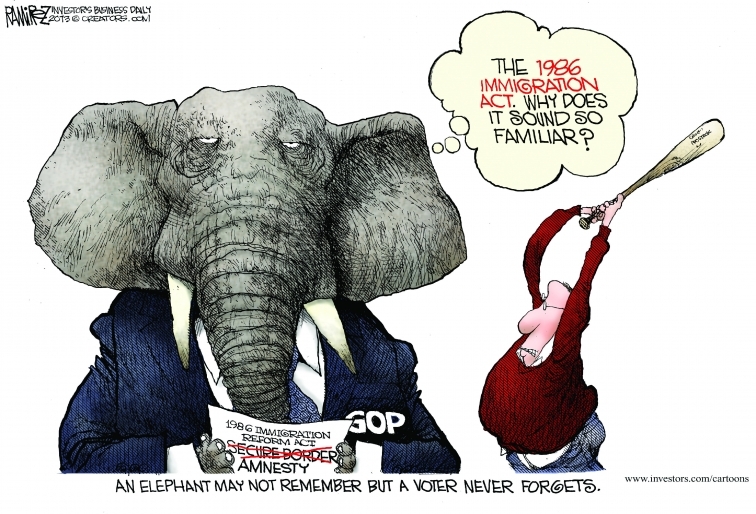 After the bipartisan back-slapping subsides, the Senators who passed the Gang of Eight’s immigration reform bill yesterday know one thing for sure – the House Republicans will ignore it. In place of the ‘comprehensive’ scheme favored by the Senate, the House GOP is already making progress in passing piecemeal legislation that tackles specific immigration issues. And, unlike the backroom deals used by the Senate Gang and its supporters, the House process is using an open and transparent committee process, reports National Review. Last week, [House Immigration Committee Chairman Bob] Goodlatte approved two bills out of committee, an interior enforcement bill and an agricultural guest-worker program. This week, he is moving one bill to expand E-Verify nationwide and to reform the high-skill-visa system. Breaking up a big issue like immigration reform into its constituent parts is the clearest and best way to solve problems. Focusing on specific policies and programs allows Members of Congress – and, just as importantly, the American public – to get their head around the main goal and the means to achieve it. Kudos to the House GOP for treating the American people, and immigration reform, with the attention and respect they deserve. 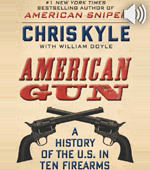 William Doyle discusses “American Gun: A History of the U.S. in Ten Firearms,” the book he co-authored with the late Chris Kyle, bestselling author of “American Sniper.” Doyle describes thrilling turning points in American history and the remarkable role that guns have had in shaping our great nation. A brilliant tweet at the time of the Thatcher funeral encapsulates the left’s ideological confusion—being in favour of coal miners and against what they mined. If you missed President Obama’s big climate change speech at Georgetown University earlier today, count yourself lucky. At this point, one has to assume that the White House speechwriters are making his remarks this dreary as an intentional means of keeping the public away from the content (in this case, a huge push to regulate carbon emissions from coal plants — the nation’s cheapest and most widespread source of electricity). 1. 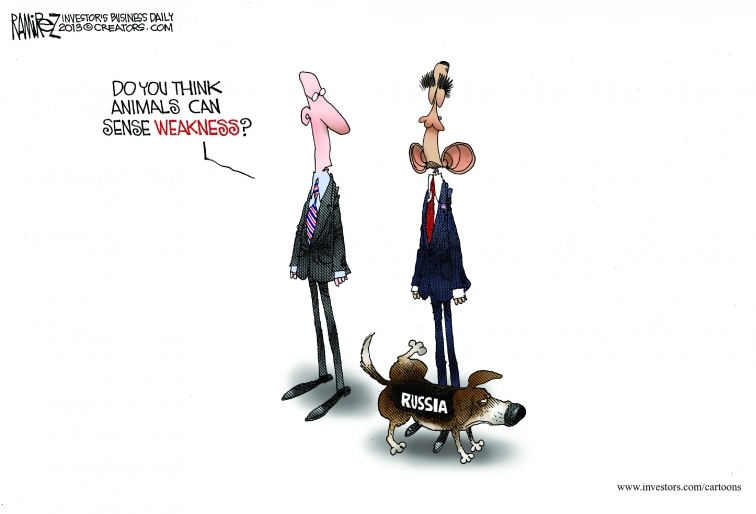 Obama is all in on executive power. In the same week that the Supreme Court announced that they’re going to take up the President’s patently unconstitutional recess appointments to the NLRB, here he was once again bypassing Congress and the public. Obama is proposing nothing less than a reordering of our energy economy (let’s not forget his 2008 campaign trail promise to bankrupt coal producers) — and he’s doing it all through executive directives to the EPA. Congress had the chance to pass cap and trade back in the first two years of this Administration and they couldn’t get it done despite the fact that Democrats controlled both houses. Part of the reason: there was a Treasury Department analysis at the time that said passage would be tantamount to a 15 percent income tax increase. The people and their elected representatives have spoken. The President has ignored them. Perhaps the president has already answered these questions in his own head, but he’s been remarkably mum about them publicly. My guess is that the glib insult is a way of obscuring the fact that he has no real responses. Paraphrasing Nancy Pelosi, they passed the bill, and now Americans are finding out what’s in it. As the U.S. Senate votes today on the Corker-Hoeven amendment – a last-minute attempt by moderate Republicans to create the veneer of bipartisanship on the Gang of Eight’s immigration bill – Rand Paul is fast-becoming the voice and face of conservative opposition. Late last week the Senate rejected Paul’s ‘Trust But Verify’ amendment that would have required annual votes by Congress to decide whether the southern border is secure. As written, the Gang’s bill punts the hard decisions about security to the Department of Homeland Security, the same bureaucracy implementing “deferred action” on over 1 million illegal immigrants. With the Senate refusing to accept responsibility for securing the border, Paul is a solid No vote on the Gang’s version of immigration reform. And for good reason. As the Kentucky Republican noted on CNN, the Gang’s bill is “dead on arrival” in the GOP-led House of Representatives. My guess is that adoption today of Corker-Hoeven – if it happens – won’t change Paul’s or any other conservative’s support because the slap-dash amendment is little more than a grab-bag of promises that can easily be nullified by DHS. As with most immigration proposals, there are no real teeth when it comes to enforcement. By contrast, Paul’s ‘Trust But Verify’ amendment makes a systemic change in immigration policy by getting Congress back in the game on border security. Putting politicians on record about the state of the border will force them to focus on the metrics necessary to make such a decision. And since a voting record is the most direct way to measure a legislator’s performance in office, you can bet that a series of border security votes will be one of the key factors in future elections. This kind of accountability is exactly what the Constitution envisions for Members of Congress. Rand Paul is right to steer clear of deceptive attempts by the Gang and Corker-Hoeven to sound tough on the border while in reality shirking responsibility. Excessive regulation has come under increased scrutiny at all levels of government, and rightfully so. Overregulation cuts into job growth and economic dynamism, sapping American vitality at a time when we simply cannot afford it. As CFIF has highlighted numerous times, that is particularly true in the wood products industry. Specifically, the manner in which bureaucratic building codes categorize lumber ends up excluding many domestic businesses from participating in critical government projects. As one prominent example, every year, more and more cities needlessly make Leadership in Energy and Environmental Design (“LEED”) certification mandatory in their buildings. The U.S. Green Building Council (USGBC) developed the LEED standards, which are in turn biased in favor of wood certified by something called the Forest Stewardship Council (FSC). That disadvantages the majority of American businesses in the forest products industry by potentially blocking them from city, state and federal projects. That’s because most domestic tree farmers, suppliers and retailers utilize wood recognized by the Sustainable Forestry Initiative (SFI) or the American Tree Farm System (ATFS) rather than the FSC. In recent years, numerous elected officials have petitioned the USGBC, urging a more rational and inclusive approach to American timber. Absent such a course correction, American wood products will remain unfairly excluded from public construction projects, as authorities give market access to timber used by a small minority of American businesses. Such a framework decreases private sector revenues and jobs. 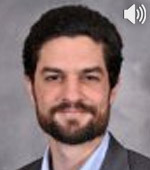 Now, new research by Forisk Consulting, prepared for EconoSTATS at George Mason University, provides further evidence of the economic costs that FSC imposes on American landowners and consumers. Their study evaluated the way in which forest certification standards affect how timber management in the South and Pacific Northwest, comparing the impact of FSC, SFI and ATFS standards on land managers in Oregon and Arkansas. The results were striking. In Oregon, according to the study, statewide implementation of FSC could result in 31,000 job losses. And in Arkansas, forcing land managers to abide by the FSC standard could reduce state timber employment by up to 10,000 jobs. Those results should not come as a surprise, given the structure of FSC. Thus, the accumulating empirical data shows the detrimental effects of making FSC certification a requirement for land management and building requirements. As the number of LEED projects increases, so do the costs of the current forestry certification framework. Fortunately, policymakers can neutralize that trend by treating ATFS, FSC and SFI wood equally, rather than mandating the use of FSC timber in our buildings. That will give more American businesses access to new markets, and encourage a competitive certification process that will result in more landowners seeking certification. Ultimately, that will benefit both the economy and the environment. A new Gallup poll of 603 small business owners shows how ObamaCare is impacting the job market, and with it, future economic growth. The main policy goal of ObamaCare is to make health insurance, and with it health care, more available to people. Doing this, however, will not make either insurance or care more affordable. The best way to make health care more available is to make it universal, preferably by a provider who isn’t constrained by cost. That would be the government. By increasing the cost beyond what companies can pay and stay in business, ObamaCare will move millions of Americans from a private sector model to a public provider model in just a few years’ time. That helps liberals achieve their main political goal: Single-payer health care, or if you prefer, socialized medicine. With ObamaCare going online in 2014, the movement of workers from private to public health care provision will complicate the reform job conservatives need to accomplish. Repeal of the law is necessary, but unless there are other reforms in place that reroute severed workers into new private sector models, it won’t be sufficient. Hopefully, a conservative consensus forms around a replacement option soon. Otherwise, Western Europe here we come! Yesterday Republican Senators Bob Corker of Tennessee and John Hoeven of North Dakota announced that the bipartisan Gang of Eight is willing to accept their new border security amendment to the controversial immigration proposal. The key elements of the Corker-Hoeven amendment are that (1) it provides for 20,000 additional Border Patrol agents, and (2) calls for completion of the 700 mile border fence, according to the Washington Post. Though the Corker-Hoeven amendment was made public after my column touting Rand Paul’s border security fix was submitted, the points I made in the Paul piece are still relevant. First, Corker-Hoeven repeats the delegation game that lets Congress claim credit for ‘doing something’ while in fact shifting responsibility for border security to an executive agency. Here, the two things Congress does are spending an estimated $30 billion to increase Border Patrol personnel, and passing a third law to build a border fence that is already required by statutes passed in 1996 and 2006. So far as I can tell, all Corker-Hoeven does is increase the budget deficit and pass a toothless resolution to do something that is almost 20 years past due. Second, Corker-Hoeven does nothing to increase Congress’ participation in deciding how to secure the border. It’s easy to pass a huge increase in spending without specifying how to recruit and train 20,000 new federal law enforcement officers. Real reform would focus on increasing frontline discretion, not just manpower, as Paul calls for in allowing immigration judges more leeway in deportation hearings. And don’t get me started on the border fence. For Corker-Hoeven to have any integrity, it would need to complete the unfinished 700 mile fence and then extend or reinforce it. Otherwise, all the amendment does is put a happy face on a complete failure by the federal government to follow its own laws. I encourage CFIF readers to check out Rand Paul’s ‘Trust But Verify’ amendment to see what is, in my opinion, the most reasonable approach to border security that is currently available. A one-page PDF summary of his amendment is here, and an interview expanding on Paul’s idea can be found here. Good ideas are out there when it comes to border security. Corker-Hoeven isn’t one of them. Regular readers know that I — partially out of loyalty to my home state, partially because of a masochistic streak — spend a lot of time writing about the public policy failings of California, a state that has weaponized liberalism and turned it on itself. Despite its massive size, enormous population, and national influence, serious analysis of California’s public policy failings was in short supply until just a few years ago. One of the biggest factors in changing that trend has been the Manhattan Institute, which launched a City Journal California website (where I occasionally contribute) and regularly featured pieces on California in the quarterly print edition of City Journal. After a few years of work, they’ve now anthologized some of the best material to provide a comprehensive overview of what ails the state and what can be done to fix it. It’s available in the form of the new book The Beholden State: California’s Lost Promise and How to Recapture It. The book features contributions from the likes of Victor Davis Hanson, Andrew Klavan, Art Laffer, Steven Malanga, and William Voegeli, in addition to several others. Yours truly is even responsible for a couple of chapters. I recommend it for all despondent residents of the Golden State, all Americans who want to learn how to keep their states from going down California’s road to decline, and every resident of Texas who likes a good laugh. Podcast: Return of the Imperial Presidency? In an interview with CFIF, Aron Mujumdar, Professor at the Florida Coastal School of Law, discusses presidential power in the age of President Obama as compared to his predecessors, warrantless surveillance and constitutional limits on the president. Jeffrey Goldberg says debate is white-hot inside the Obama administration over whether to use U.S.-led airstrikes against Syria’s airbases. According to Goldberg’s sources, Secretary of State John Kerry is calling for immediate and sustained airstrikes to punish Bashar Assad’s regime for using chemical weapons against rebels. Earlier, President Barack Obama had said that such use would justify an increased American response to the rising number of deaths in the war. But Kerry’s airstrikes idea was shot down in a tense Situation Room exchange by Army General Martin Dempsey, the current Chairman of the Joint Chiefs of Staff. The Pentagon estimates that at least 700 sorties would be needed to effectively destroy the airfields. That increases the probability an American pilot would be shot down, killed or taken as a prisoner of war. The dilemma on Syria is this: No one wants the conflict to turn into another occasion of genocide like Rwanda or Darfur, but no one is eager to get involved in a fight where the choice of ally is either the Hezbollah-aligned regime or the al-Qaeda-aligned rebels. So far, the Defense Department is winning the argument. The absence of a clear definition of victory means the Obama administration likely won’t do much else than send small arms and ammo to the rebels – a symbolic gesture that won’t do much to change the course of the war. Considering the information available, that’s probably the best move to make. 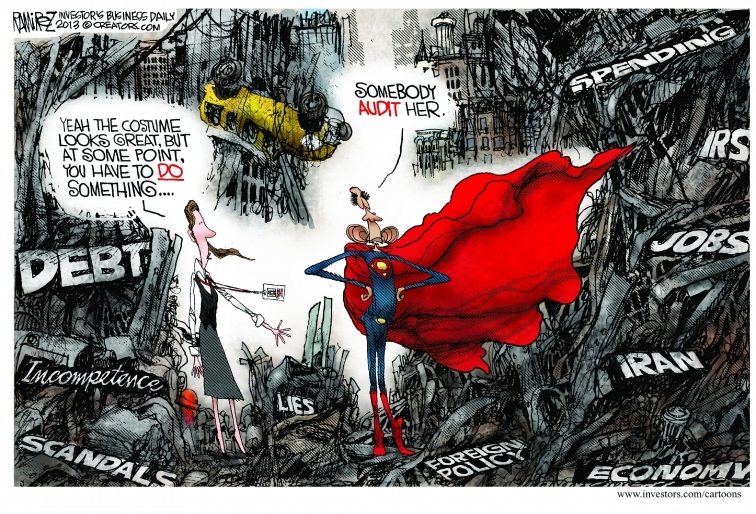 The Obama Administration, Congressional Democrats and liberals generally may claim that the IRS scandal is essentially resolved, that “there’s no there there.” The American people disagree, and in growing numbers. It seemed as though the cascade of Obama Administration scandals might paradoxically mitigate the gravity of any one of them individually. But from this poll and Obama’s plummeting approval numbers, it appears that a healthier sense of sobriety prevails, at least for now. The North and South have come to resemble a couple who, although married, dream very different dreams. The South, along with the Plains, is focused on growing its economy, getting rich, and catching up with the North’s cultural and financial hegemons. The Yankee nation, by contrast, is largely concerned with preserving its privileged economic and cultural position—with its elites pulling up the ladder behind themselves. … While the Northeast and Midwest have become increasingly expensive places for businesses to locate, and cool to most new businesses outside of high-tech, entertainment, and high-end financial services, the South tends to want it all—and is willing to sacrifice tax revenue and regulations to get it. A review of state business climates by CEO Magazine found that eight of the top 10 most business-friendly states, led by Texas, were from the former Confederacy; Unionist strongholds California, New York, Illinois, and Massachusetts sat at the bottom. … Over the past five decades, the South has also gained in terms of population as Northern states, and more recently California, have lost momentum. Once a major exporter of people to the Union states, today the migration tide flows the other way. The hegira to the sunbelt continues, as last year the region accounted for six of the top eight states attracting domestic migrants—Texas, Florida, North Carolina, Tennessee, South Carolina, and Georgia. Texas and Florida each gained 250,000 net migrants. The top four losers were New York, Illinois, New Jersey, and California. There are only two options for the boutique coastal states and the union-dominated interior: emulate the South or be supplanted by it. This should be fun to watch.